I just watched a preview screening of the science fiction film Oblivion and quite both liked it. 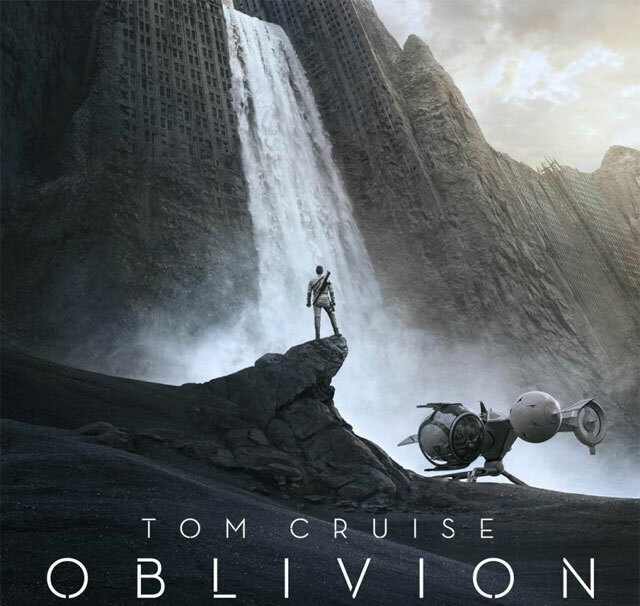 It’s a fitting name because Oblivion means both the state of being completely forgotten like the main protagonist Jack (Tom Cruise) who has lost his memory of the past and the state of being completely destroyed which accurately describes the film’s visual backdrop of the Earth and Moon in their sombre monochrome devastated post apocalyptic states. Oblivion has an evocative soundtrack and the pace is measured not frenetic, slowly revealing information and on several occasions keeping the audience guessing with plot twists. The storyline focuses almost exclusively on a handful of characters played well by Tom Cruise (Jack), Andrea Riseborough (Victoria) and Olga Kurylenko (Julia) with a solid supporting actor performance by Morgan Freeman (Beech). After the screening my friend and I both agreed that Oblivion explores ideas like whether we can trust our memories, what it is to be human, over reliance on technology and rebuilding the human race better than the second and third Matrix films which got bogged down in complicated and confusing theology. Many reviewers have awarded Oblivion 2.5 or 3 stars but I think it deserves a 3.5/5 rating. Sure it’s no Bladerunner but it’s a solid science fiction movie with spectacular visuals that is worth watching at a cinema with a large screen and good audio such as IMAX. Credit must go to Universal for shooting the film in stunning digital 4K resolution on location across the United States and Iceland rather than opting for gimmicky 3D. If you heard a thrumming noise above your head while you were walking down the street today you’d probably just think it was a helicopter passing overhead. In the not so distant future it could well be the sound of a law enforcement drone on patrol. It’s been a long time since drones were science fiction, they are now very much science fact. Drone is the more commonly used name for unmanned aerial vehicles (UAV’s). UAV’s are aircraft that are either autonomous, with their reactions based on programming, or manned remotely by operators nearby or potentially as far away as a different country altogether. Readers who watched the recent film Bourne Legacy will have seen a hunter killer drone in action during the early part of the film and wondered if this was real technology. The answer is yes. Drones have been used extensively to carry out assassination of “enemy combatants” in recent international war zones. “We live in a world where there are actual fleets of robot assassins patrolling the skies. At some point there, we left the present and entered the future”.